Can anyone post any photos of the old Huntingdon Square in Sighthill, Glasgow. 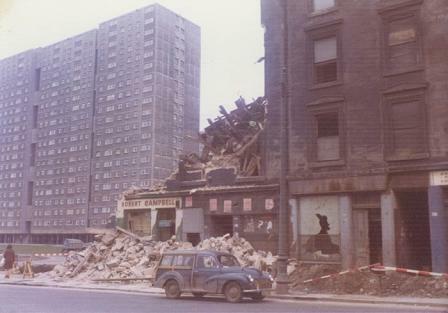 The square was located behind the building in the attached photo of the old tenement being destroyed facing the entrance to St. Rollox works on Springburn road. The square had a large swing park that was 80 - 100 feet behind the old tenement but a bit more further to the right. The old square was demolished around 1969. My last memory of it was on the night of the great gale in January 1968 when I was 9 years old. I was in the swing park when the gale started and after about an hour or so got frightened and headed for home [was virtually blown there] I seem to remember there was some housing that was like terraced types but have been told a couple of times that there where no terraced housing in that area. I still seem to have it in my head that I am right but I am not 100% sure and it annoys me.